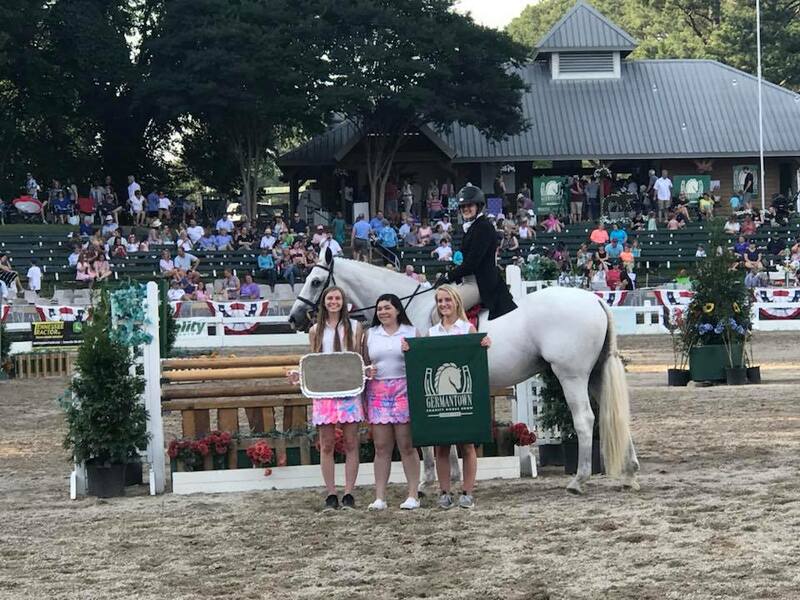 The Fox Lake Farm team took on the Germantown Charity Horse Show to much success during the first week of June! Ginny Joyner and Michael Allen left straight from Brownland for Germantown and spent the week at one of the most fun horse shows of the year. Many breeds are on display, and there's a whole host of entertaining classes not found at your typical horse show! Abby Beaty had a spectacular week, taking Champion in the High Children's Jumpers with a 2nd in the WIHS/NAL Children's Jumper Classic with Via Dolorosa. Aboard Corrado, Abby took 8th in the Hunter/Jumper Versatility Challenge out of a huge group--many of them professionals, including Michael Allen who piloted Cynthia Hallman's Fig Street's Duchess to 3rd. Abby also took 2nd in the David Q. Wright Hunter Classic aboard "Corey," finishing just behind barn-mate Lucy Reich, who rode her own Indelible to the win! Lucy Reich also took champion in the 3'6 Junior Hunters aboard "Deli," her first time out since stepping up from the 3'3 Juniors. Katie Habeeb also had a good weekend with both of her mounts, with top ribbons in the Older Children's Hunters aboard Simply Red, as well as some good rounds aboard Alto Aviador, including 2nd in the THIS Children's Medal. Campbell Swanner tackled the Younger Children's Hunters aboard THS Pia-Lena and had top 3 finishes in every class but one! All of our pony riders also had a solid weekend: Hagen Blackwell took Reserve in the Medium Ponies on Footsteps and in the Large Ponies on Hey Scooby; Mary Mac and Charlotte Illges also had strong rounds and top placings. Mary Mac piloted Sugarbrook Georgia Peach to several top 3 placings in the Mediums, and Charlotte successfully tackled the Smalls with Winnie the Blue! We're enjoying some time at home before the crew heads back to Brownland in a week!